Selecting the right social media book can be as dizzying as one’s first foray into Twitter or Google+. Where to turn first in this vast Wal-Mart of online magic hawked by sellers of snake oil and those with a product of genuine value? And how can one harness any of these cryptic tools? Does anyone really get it? This is where author Sharma Kabani and The Zen of Social Media Marketing come in. Yes, Ms. Kabani gets it. After reading the book you won’t become an instant expert, in part because what works in one situation and for one social media practitioner is not the same for all others. There is quite a bit to master. And you will need to experiment for a while before you find your sea legs. At the outset, as in nearly every social media book, we are told that social media marketing is about engagement. And yet the message resounds unusually clearly in these pages. In part this is due to the author’s always accessible and genuine prose written for the non-techie. Also Ms. Kabani quickly gets to the heart of the differences between new versus old media marketing. The author also makes clear that social media marketing is of little value if not associated with a website and a blog. She lays out an abbreviated description of some components of compelling ones. Surprisingly, we next find ourselves in the daunting territory of SEO−Search Engine Optimization. Why surprising? Because in the specialized world of online technology and technique it is rare to find an expert on one topic who is also conversant in another. It’s unclear whether the author is also an SEO expert. What we do know is that she is wise enough to understand that a blog or website with poor SEO faces an uphill battle. And so she educates those reading her book on some of the critical basics, typically overlooked in a social media book. Social media and SEO advice can be contradictory. There are Twitter experts that will suggest it is best to follow back anyone who follows you on Twitter, that this is Twitter etiquette. On the other hand, an SEO expert will likely tell you that Google probably values a website with a Twitter presence higher if it follows few on Twitter, but has legions of followers. Nowhere in The Zen of Social Media Marketing is there advice at odds with sound SEO practices. After explaining why many companies fail in their social media strategy, Ms. Kabani provides guidance for managing four of the most important social networks: Facebook, Twitter, LinkedIn and Google+, covering such varied topics and imperatives as use of keywords, how and when to post, the value of Facebook Connect in logging on, choice of certain social media buttons, tools to optimize one’s social media efforts, the importance of a headshot on LinkedIn, and an almost endless number of other considerations and devices. Those already using these platforms will find themselves jotting down a list of tips. Neophytes on the other hand may be overwhelmed. And so it is utterly sensible that Ms. Kabani suggests beginning with just two social media networks. There is also a chapter focusing on video. This is important as YouTube is actually the second largest search engine, after Google, its owner. But of course this versatile author is aware of the minor SEO techniques that will fill in the search engines about the video’s content. And YouTube videos, properly tagged, often rank high in Google search. The final chapter includes a number of social media case studies. What is most striking is that among these dozen examples, different social media networks or combinations of them are favorites of the various social media practitioners who each use them at least somewhat differently. And this makes more resounding the advice that one start by working toward mastery of just two social media networks. Indeed how many social media networks can we love at once? Bigamy seems to be a healthy maximum for one to attain the required intimacy for personal or organizational success. 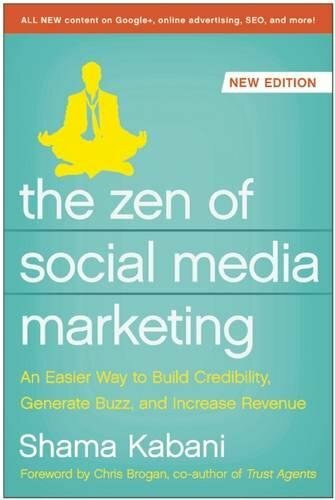 The Zen of Social Media Marketing is brimming with sage advice about how to use social media tools. In the end it most succeeds where many other books come up short: in fully communicating just how one can use social media to make connections that are not simply good for business, but also truly human. Ted Sturtz is the founder of New York Journal of Books. He created all of the technical specifications for building the public NYJB website as well as for highly complex, yet user-friendly administrative functions that uniquely streamline the book review process.